Present state: Demolished - access ramp up from the road remains. A mound marks the site of the southbound platform. Notes: Gerards Bridge station was on the St Helens Canal & Railway Company’s (SHC&RC) St Helens and Rainford Junction line which opened on 1 February 1858. The line was actually part of a through route between St Helens and Ormskirk, the section between Rainford Junction and Ormskirk being built by the East Lancashire Railway (ELR). Both companies had co-operated in building the two lines, the relevant Acts being granted on the same day in 1853. At Rainford Junction the line connected with the Lancashire & Yorkshire Railway (LYR) Liverpool and Wigan route. Gerards Bridge opened on 1 February 1858 as one of the original stations on the line. It was beside Haresfinch Road which passed under the railway immediately south of the station. The main access was from Haresfinch Road on the west side of the line. The booking office was also west of the line which was at first single-track. No goods facilities were provided. 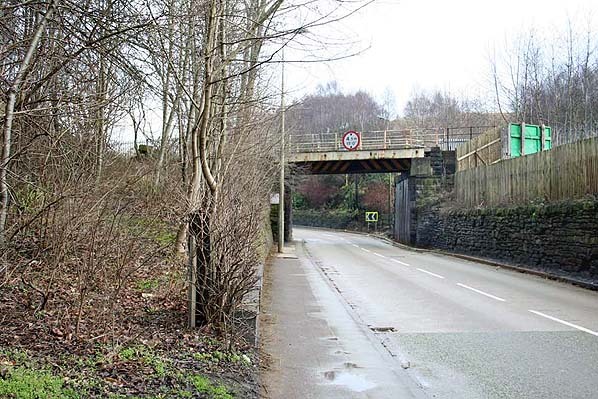 Gerards Bridge was initially served by 4 trains per day in each direction between St Helens and Rainford Junction. On 1 August 1864 the SHC&RC was taken over by the London & North Western Railway (LNWR) but the LYR maintained its running rights over the line between Rainford Junction and St Helens.The Lancashire Union opened its line for goods from Gerards Bridge Junction to Ince Moss Junction and thence to Wigan North Western on 1 November 1869 .No attempt seems to have been made to relocate Gerards Bridge west of the junction, so it continued to be served only by Rainford Junction trains. 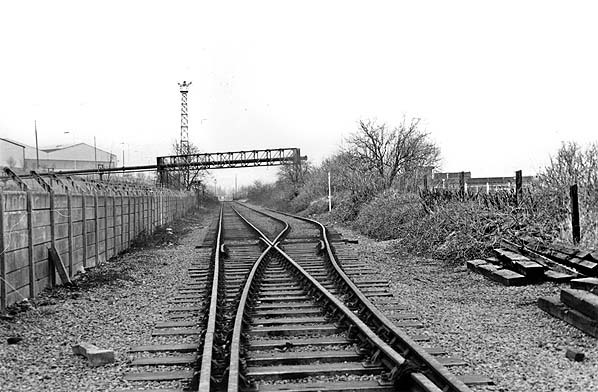 In 1890 the line was doubled and Gerards Bridge received a second platform for trains towards St Helens whilst the original served Rainford trains. The St Helens platform had a simple waiting shelter and steps provided direct connection to Haresfinch Road. The December 1895 timetable showed 6 trains to Rainford Junction and 5 to St Helens Monday-to-Friday as seen in the table below. On Saturdays there was van extra train in each direction but no trains called at Gerards Bridge on Sundays. Gerards Bridge was not a long-term success and, with the exception of the experimental first Rookery station, became the first on the line to close on 1 August 1904. Passenger trains continued to pass through the site of the Gerards Bridge station until their withdrawal in 1951. Through and local freight continued until 1964 and the local carrying of sand continued until 1967 when the line was cut back to Pilkington Sidings. 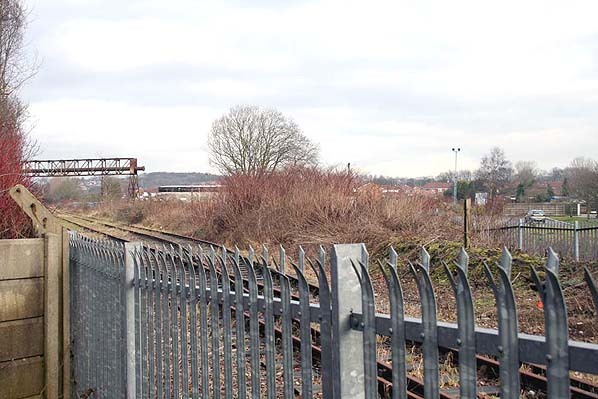 Pilkingtons continued to receive freight over the remaining stub of the Rainford Branch which passed through the station site until the last reported movement of bulk oil tanks in 1998. Track remains in situ and mounds of earth indicate the location of the southbound platform. The site of Gerards Bridge station looking north in 1990. Gerards Bridge station shown on a six-inch scale map from 1858. Gerards Bridge station shown on a six-inch scale map from 1892. The direct line to Wigan is seen branching off from the original route to the south of the station. Gerards Bridge station shown on a 2:1,500 scale map from 1894.. 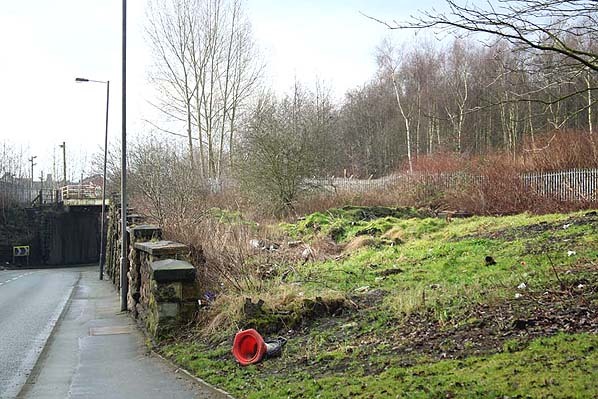 Looking north-east at the site of the Gerards Bridge station access road, to the left, in February 2006. The station building was at the far end of the road to the left of the Haresfinch Road bridge. Looking south-west at the site of Gerards Bridge station in February 2006. The site of Gerards Bridge station in February 2006. The photographer is standing where the station building would have been located.